I have been searching for the "perfect" challenge for months now, and I think I finally found it -- the Shelf Discovery Challenge! I can't even begin to tell you how excited I am to host my first challenge, and I think it's just a perfect fit for me and my blog. As a mother of a middle grade daughter, a member of a mother-daughter book club, and a lover of middle-grade and young adult fiction, I was just thrilled when I "discovered" a new book by Lizzie Skurnick called SHELF DISCOVERY: THE TEEN CLASSICS WE NEVER STOPPED READING. If you haven't seen this book yet, then you are definitely missing out because it's a wonderful read. SHELF DISCOVERY is a book that takes me back to my childhood because it features many of the books that I loved as a young girl -- you know, those books and authors that defined our youth such Judy Blume, Laura Ingalls Wilder, etc. SHELF DISCOVERY is a "reading memoir" which features over 70 MG and YA classics with Ms. Skurnick's unique impressions. There are also essays about these classics written by current women writers including Meg Cabot, Laura Lippman, Cecily von Ziegesar, and Jennifer Weiner. As I read this book, I fondly remembered many of the books that I read years ago -- often times, over and over again -- such as FROM THE MIXED-UP FILES OF MRS. BASIL E. FRANKWEILER, BLUBBER, THE WESTING GAME, THE GROUNDING OF GROUP SIX, and LITTLE HOUSE ON THE PRAIRIE to name just a few. I also realized that there were a lot of books that I missed out on and would love to read now -- like a WRINKLE IN TIME. There are just so many wonderful classics for teens that are featured in the pages of this book -- I hardly know where to start! So, that's why I think the Shelf Discovery Challenge will be so fun! By participating in this challenge, you can revisit some of your childhood favorites while also having the chance to read some of these classics for the very first time. And even if you've read some of these books over and over again as a young girl (like me), I think that by re-reading them now we will appreciate them for entirely different reasons. On November 1st, 2009 I will place a Shelf Discovery Challenge button in the upper right hand corner of my blog. When you click on this button, you will see a post where all the participants are listed as well as the links to your Shelf Discovery updates and "book reports." So, every time you have a post relating to the Shelf Discovery Challenge (with the exception of your first sign-up post) you should leave a comment there with a link to your post. Besides your initial challenge post, I'm also asking for your help on spreading the word via Twitter. My Twitter ID is @bookingmama and I will be using the hashtag #shelfdiscovery to discuss the challenge and books that we are reading. Please make sure to follow me on Twitter for updates and additional information. 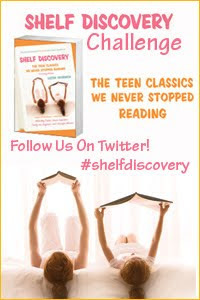 I have 10 copies of SHELF DISCOVERY courtesy of Avon Book, Harper Collins to giveaway! To be eligible to win, all you have to do is sign up for the Shelf Discovery Challenge and leave a comment with a valid email address! I will select (and notify) the winners on November 1st! There will be other prizes given away during the challenge period! I'm not entirely sure what they are yet, but I'm working on it! I read Shelf Discovery last month and LOVED it, so I won't be entering your giveaway :-). The challenge sounds like fun, definitely! I'm excited about this challenge! Don't enter me since I already have the book. OK, I'm in for the challenge. I have the book (must pull it off my 13-yr-old's bookcase!) and will select my 6 books this weekend. This sounds like a book I need to check out. i have too many challenges going on right now but I'll definitely check up on yours! I loved FROM THE MIXED-UP FILES OF MRS. BASIL E. FRANKWEILER, THE WESTING GAME,and Wrinkle in Time. Oh, poo! Looks like I must enter yet another challenge. I simply can't pass this one up. Love it! This looks like fun and I've never done anything like it before. Honest! I can't wait!!! This is my first challenge. I am so excited!! Oh, I am definitely in for this one ... how can I resist?! Great idea for a challenge. Thanks for entering me for the book! I am so excited by this. I got this at the Harper Party and loved it. Thought about doing a personal challenge by reading all of the books- so this is great. I would love to host mini-challenges or help out in any way you need. I have to think about my books. I would love to win a copy! I linked my [brand-spanking-new] blog to this post. Can't wait to read some new titles and reread some favorites with a new perspective. Oh, how I love children's literature! I was just looking longingly at this book in the bookstore. While I can never make promises in challenges, with the craziness of my schedule, I LOVE the sound of this one. So kudos to you for coming up with it, and for hosting such a perfect challenge. Very well done. Okay, I'm in. I don't have the book though,so will see what books others are picking before I make my choice. Hopefully I'll have my post up soon. I'm in the midst of a major reread of childhood favourites, so this is perfect for me. I haven't read Shelf Discovery but I read many of the Jezebel columns it grew out of, so I'm confident that there's plenty of overlap! Please enter my name for the book draw too. Thanks! Alright, I'm going to do my first challenge. Sounds like fun! My post is up. Thanks for sending me that link. I'm excited and planning on sharing the books with my daughter. No need to enter me to win a copy since I work at harper, but we'd definitely like to host a mini-challenge over at the olive reader (the harper perennial blog.) I LOVE this book and rereading old favorites. I also own a copy so will not enter the drawing, but I agree - what a great challenge! I would love to enter the book giveaway plz!! Don't have one..but will look at what others put on there list and choose..or run to bookstore and 'look' at one of the books to choose!!! And as you said..I can always change my choices later too!!! Thanks!! signing up for challenge now! The shelf discovery challenge sounds like a lot of fun! This is so fun! These are the books that always stay with you and reading them again is like comfort food! Sounds like a great challenge. Lots of time to get it done too, so I'm in, for sure! Okay, I'm going to be signing up, I just have to get this book from the library so I can pick my reads. My kids are the right age for this, so maybe I'll join and we'll read together. I'm on the fence. Anyway, I've posted about this at Win a Book. I love it! Thanks for thinking to ask us to list it there. This sounds like great fun! A Wrinkle in Time will definitely be part of my list. Thinking about the rest. Can't resist any excuse to revisit my shelves. Please enter me, too! This is my first challenge and I know it will be fun. Would love to win the book too. I would love to do this challenge. I have my list of books and linked back to you posted at my place, Just Books. Have a great day!! Great challenge! I'm looking forward to it. This is so crazy because I just today made a post about how my tastes in books haven't changed from when I was a kid, and then I found out about this today. I'm in and I would love to win a copy of the book. This is going to fun! I've never done a reading challenge before, but I think I will do this one! Great idea. I will link back tomorrow with my picks. I've never done a challenge before but this sounds intriguing... sign me up! Off to select my six books! Linked here from Rachel at Chaos is a Friend of Mine. This is right up my alley! Seeing the title "Grounding of Group Six" (which I loved) reminds me that I have been trying to think of the name of a book I read years ago about all the adults of the world dying off from some illness and the children having to build a fortress at an old school to protect themselves from other harmful kids. Does this ring a bell with anyone? How FUN...I haven't picked my books yet but this sounds fabulous! I'm totally signing up, but I want to look at the Shelf Discovery book before I pick my books! I've never heard of some of them! I'm in! MY first challenge ever! (I don't need the book). Thanks for hosting! I finally posted my picks! I would love to win a copy! Thank you for the contest and the information earlier! Coincidentally, I just discovered this book on Amazon. Even just reading the blurb from the book really takes me back - I LOVED the Westing Game. I'm so excited to participate in this challenge! Thanks for hosting! I'd really love to read Shelf Discover too! Please enter me! I'm in too and I'm sending out positive energy to win this book. I would love to read it and I have my doubts that my little library will get it. Thanks for a great challenge. Yay! This is my first challenge. It sounds so fun. I can't wait to get started. Count me in for the challenge and the draw! I'll post my six picks soon! Okay, my blog has been dormant for a long time but this is just too good to pass up. I'm in. Thanks for hosting. This is awesome! I posted my selections on my blog. Thanks for hosting the challenge and for entering me in the drawing. I came out of a 14 month blogging hiatus to join the challenge! Just got my post up! Can't wait to re-read some of these! Fantastic! I'm in. This sounds like the right challenge for me. No need for me to win the book - I was lucky enough to be given a galley last Spring. Please count me in! Just got my copy and am choosing my books now. Can't wait to start reading! It is so funny how everything is connected. I just finished the Wrinkle in Time series for my book club meeting next week because we wanted to read something that we read as young people that is on the Banned Book List. So now I just have to pick five more. I am joining in - I am going to read (again) the 'Little House'series - all 7 books. I tried to grab one book from each chapter, so I have two extras, which will be extra credit. I could have sworn I signed up for this. Oh well. Oddly enough, I just got this book at the library and was amazed to realize just how many classics I missed out on. So now I'm looking forward to catching up. This will be fun!! I am all over this challenge. These are all rereads. I have read 3 already (in December) so I may do more than 6. I Loved SD! I love the idea of this comment and I will post my books on my blog...thanks for the challenge!!! I posted a page with ALL current reading challenges. Let me know if you want me to add any other information about yours. I hope it brings even more readers to your challenge! I would love if this were an annual challenge! Any chance you'd do it again for 2011?